Easy to install, with auto-learning capabilities. 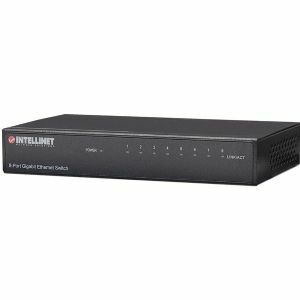 The INTELLINET NETWORK SOLUTIONS Gigabit Ethernet Desktop Switch is perfect for the home or small office, delivering top speeds to the desktop to satisfy your demanding network needs. 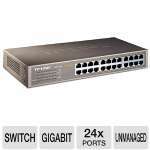 High-Speed Performance This desktop switch includes eight Gigabit Ethernet ports, providing you with high performance on your network to handle quick transfer speeds to support disk mirroring, data backup, graphics image file transfers and other bandwidth-intensive applications. 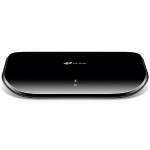 Auto Features This network LAN switch includes many auto features that make it easy to use. 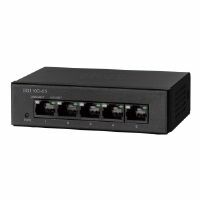 No configuration is required, making installation Plug and Play and hassle free. And Auto-MDI/MDI-X crossover on all ports eliminates the need for any crossover cables. 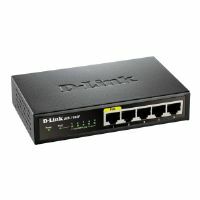 Each of the eight ports on this network LAN switch automatically senses the link speed of the connected network device and adjusts to 10, 100 or 1000 Mbps for compatibility and maximum performance. 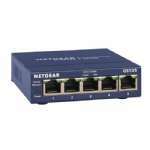 Reliable Operation The Gigabit Ethernet Desktop Switch supports flow control when operating in half duplex mode, and supports IEEE 802.3ab in full duplex mode, ensuring that your data transfer and network connectivity continue to run smoothly and uninterrupted. 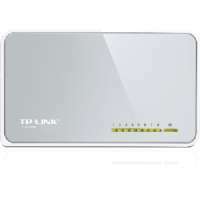 This, in conjunction with the broadcast storm control and the store and forward switching method, further ensure that your connections remain active even under extremely busy conditions. 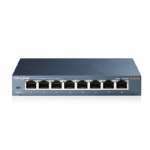 Lifetime Warranty Strict manufacturing standards ensure the highest quality in all INTELLINET NETWORK SOLUTIONS products. All items carry a full Lifetime Warranty (R) the strongest quality commitment anyone can make.